Here is a quick progress picture of a quilt I've been working on over the past few months. 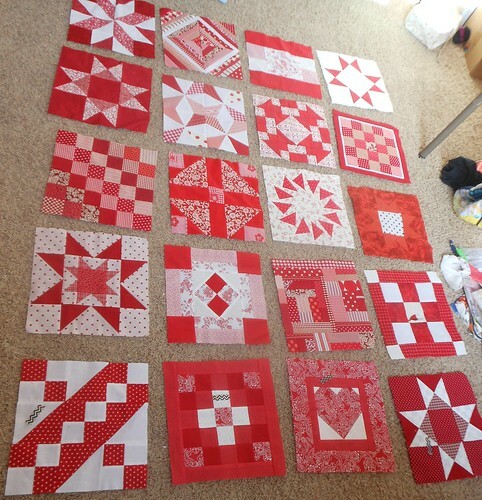 These are the blocks for my Red + White Friendship Sampler, made with the help of the lovely ladies in my local quilt club. Last year our club celebrated it's 10th Anniversary (I've been in 4 yrs). In honor of that big milestone we decided to help each other make a "friendship" quilt. Each of us got to pick our own color scheme, while block designs were left up to each member's talents/discretion. I'm working on the finishing touches so it will be ready for the big reveal. And you are way too talented!!! This is fabulous! Love, love, love the red and white. I will dafinitely check back for the finish!! Loving this red and white project! Such impact! Two color quilts are so classic. I love your set of blocks and can't wait to see what you make from them. Classic with a modern twist. I love it. Really loving the monochromatic scheme you have going on here. Very pretty!! I love red and white quilts. It's beautiful, the simplicity of the colour scheme shows the blocks off well. Love your red and white sampler. I am doing lots of red and white at the moment too! It is gorgeous so far! I just love red! Your red & white quilt is so pretty! How fun to have a sampler made up of blocks from your local guild. At the school where I teach we started a small sewing club after school and have been teaching the girls to hand piece and quilt. We just finished 9-patch doll quilt samplers that we swapped blocks on. They turned out really sweet for their first little quilts.